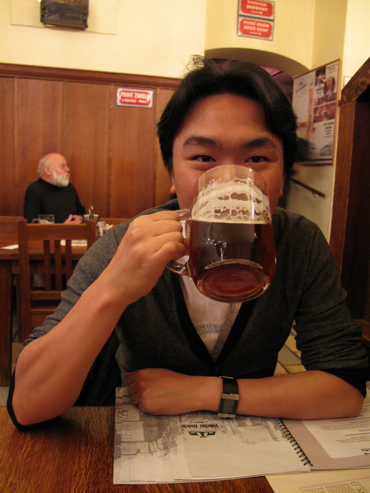 Prague really is a beer drinker’s wildest fantasy. When beer is cheaper than water, it would be a serious crime not to take advantage of the arbitrage opportunity and drink oneself silly. The Czechs did invent lager after all and true to their Bohemian brewing roots, the capital is home to Microbreweries galore… a resurgent movement of independents going against the grain of mass-production, brewing delicious, unpasteurised varieties on-site served in atmospheric beer halls. 4 days and more than 6 brew-pubs later, I’ve come to the realisation just how much more there is to Czech beer than the archetypal Staropramen and Budvar we all know. U Fleku: 500 years on, this historic Prague institution has become synonymous in stature to landmarks like the Old Town Square and Charles Bridge. Everybody (including armies of tourists by the bus-load) come for the 13° black beer – a smooth, mildly bitter ale known as Flek (59kr for 0.4l). Be warned: its about as smoky as a fish smoker’s oven and the staff are a little grumpy and will ignore those (like yours truly) who don’t follow proper Czech pub etiquette. But the blaring horns of Oompah music accompanied by raucous singing patrons give this beer hall one heck of an atmosphere. 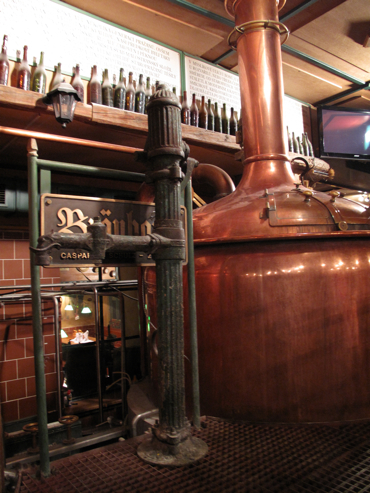 U Medvidku: “The Little Bear” is, as it says on the tin, the capital’s most micro of micro-breweries, producing a mere 30,000 litres of beer a year. 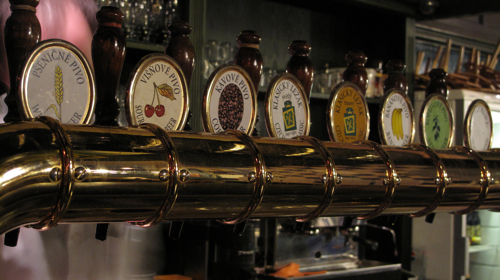 Although U Medvidku’s beerhall has been around since the middle ages, it only restarted its brewery facilities in 2005 after a large-scale restoration project. The multi-floored complex now houses a 33 room boutique hotel, restaurant and beer hall all under one roof. Its claim to fame is its potent X-33 beer- a dark varietal with a whopping 12.6% abv, the world’s strongest. Less gimmicky and much more delicious is the 13° OldGott Barique 5.1% – a bold, tasty amber beer thats perfect with their fantastic Czech specialities such as Pork knee with sauerkraut. They even make their own beer ice-cream here! Once you used to the mildly bitter after-taste, this sweet, malty treat is one that I guarantee will grow on you even if you aren’t a beery person. 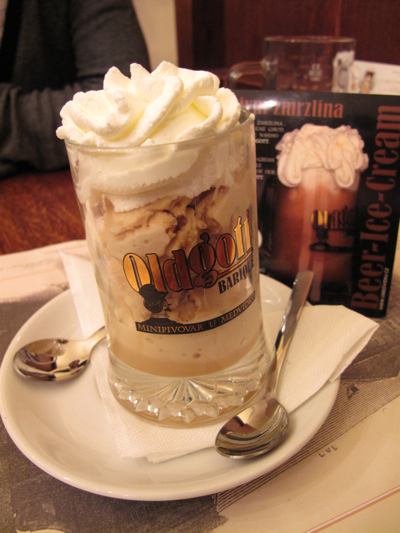 Yes, you guessed it… its Beer Ice-cream. Klasterni Pivovar Strahov: Perched at the very top of hilly Hradcany beside Prague Castle, this brewery on the Strahov Monastery’s grounds is one of Prague’s oldest, with records of the brewery’s operations dating back to the 13th century. We made an unplanned pit-stop here to shelter from the rain with our Segway tour guide Tomasz who recommended we sample the St Norbert polatmavy beer (36kr for 0.25l). If you like Belgian Trappist beers like Chimay or Orval, you will love this rich, full-bodied, amber brew which is brimful of hop. So divine, it even made the rain go away. Branicky Sklipek: Branik is the quieter, lesser known sister brand to its socialite sibling Staropramen. One of the smaller ‘local champion’ brands in the Anheuser Busch empire, it is particularly under-rated and could easily be marketed into an export giant in my mind. If you look hard enough between the Pilsner Urquell and Budvar signs, there are a small number of pubs and rough-and-ready beer halls like Branicky Sklipek in New Town branded with the Branik stamp, serving up their light and dark lagers. 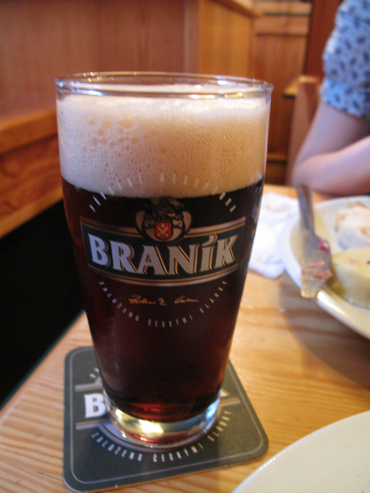 Branik’s dark beer is particularly good… medium-bodied and smooth with creamy caramel undertones, its by far the easiest drinking dark beer I enjoyed on this trip. And for a city centre pub, its as cheap as it gets. 24kr for o.25l and 40kr for 0.5l. Pivovarsky Dum: A short 10 minute walk south of Wencelas Square in New Town, Pivovarsky Dum has the feel of a local, off the beaten track brewpub. As opposed to other beer halls which wreak of stale tobacco, the no smoking policy here means the only smells which greet you upon entering are the faint fragrance of malt and hops. 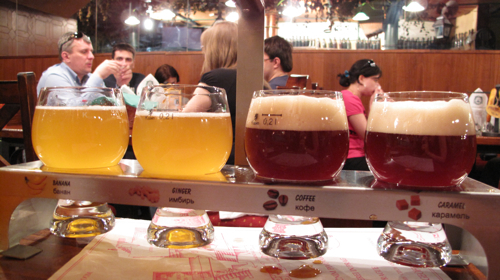 We ordered their Beer Tasting set which comprised of 8 different 0.1l samples including the house beer, Štěpán. Brewed on the premises in both dark and light varieties, at 35kr for 0.5l, its the cheapest half-litre of lager in the city centre. However, neither Stepans made an impression on us. The light beer was too watered down and flat for my liking while the dark tasted so bitter and smoky, it felt like I was drinking a liquefied cigar. 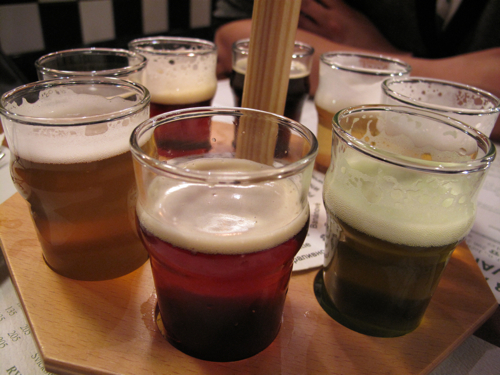 Other flavours in the set included coffee beer, wheat beer, sour-cherry, nettle and banana flavours. The fruit beers were a bit of a let-down. Having come straight after dinner, we were craving bag-loads of sweet, Fruli-esque flavours to cap off the evening. The fruitiness was there initially, but the extremely low sugar content of the beers meant that the flavours got drowned out within seconds of swallowing. The stand-out sample and only one worth a good word was the wheat beer – a Hoegaarden, only smoother, crisper and deeper in flavour. 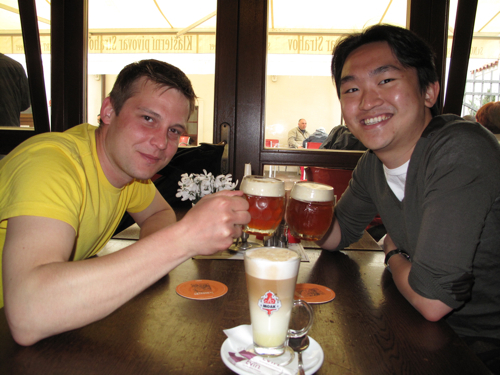 Novometsky Pivovar: The ‘New Town Brewery’ was our last stop before flying back to London, and what a send-off they gave us. Aside from the Pork Knuckle which I will rave about in a separate post, the light beer at a mere 38kr for 0.5l was an absolute bargain and had the crisp, smooth, and tangy kick of hop I was starting to love and look out for in a Czech-style lager after 4 days of amateur beer connoisseur-ing. We also gambled on their Beer Tasting Menu – this one a set of 4x 0.2l samples with Banana, Ginger, Caramel and Coffee flavours on offer. Unlike Pivovarsky Dum’s unsweetened beers from the night before, these were completely on the money and had both the sweetness and depth of flavour we had been craving for. The Caramel beer for us stole the show – the rich, burnt sugar aromas emanating from the creamy beer head are enough to make you want to melt into the golden-brown liquid and become part of the lager. Absolutely delicious. Na Zdravi** to all. Please enjoy responsibly. 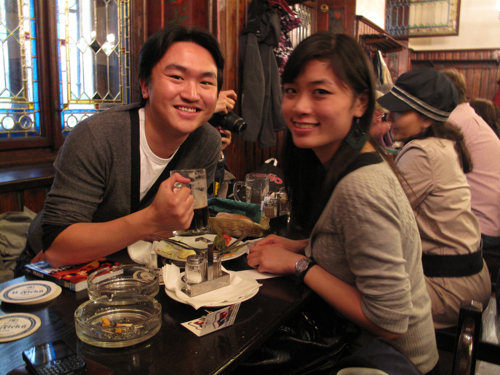 **“Cheers” in Czech, literally meaning ‘to your health’. After all that boozing, it should probably read to MY health.